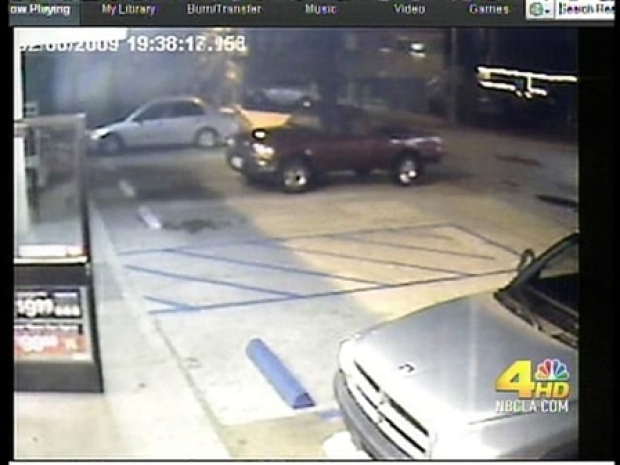 LAGUNA BEACH, Calif. -- Police used surveillance video to solve the case of a missing truck. The mystery began when Michael Otero exited a Laguna Beach convenience store to find an empty parking spot where he had parked his pickup truck. "It's almost like a ghost," Otero told the Orange County Register newspaper. Investigators expected to find video of the thief on the store's surveillance video. Instead, the video shows Otero's truck as it slowly rolls from the parking spot in reverse and into a nearby parking structure. Surveillance video captures an unmanned truck playing hide-and-seek with its driver. The truck was hidden from Otero's view when he left the store. It came to a stop in a vacant parking spot after scraping a wall and concrete barrier. "I'm just cracking up," he told the Register. "I just thank God it didn't hurt anyone." The newspaper reported that the truck sustained minor damage. Otero told the newspaper that the parking brake was engaged and the manual shift was in gear. The newspaper reported that Otero plans to have a mechanic examine the vehicle.